April 23, 2018, New Delhi, India – On arrival at the Lal Bahadur Shastri Institute of Management (LBSIM) in the New Delhi suburb of Dwarka this morning, His Holiness the Dalai Lama was received by the Director, Dr DK Srivastava and the Chairman of the Board of Governors Anil Shastri. 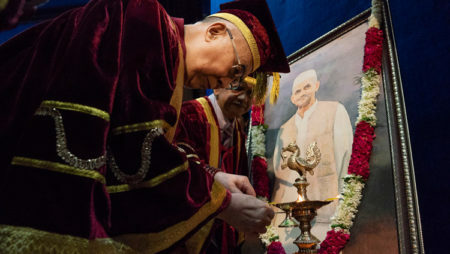 Since His Holiness had known India’s second Prime Minister personally, without further ado he approached the bust of Lal Bahadur Shastri, mounted on a pedestal before the Institute, to offer a white scarf and pay his respects. Having donned the academic robes as well as the hat, His Holiness took part in the academic procession into the auditorium. On the side of the stage he joined Shastri’s son, Anil, in lighting a lamp and offering flowers before a portrait of Lal Bahadur Shastri. After Anil Shastri had declared the Convocation open, Director of LBSIM, Dr DK Srivastava gave a brief welcome address and read a report outlining the Institute’s achievements. Anil Shastri spoke next, recalling his friendship with His Holiness. He reported that he first met him as a schoolboy, when he touched his feet. Later, when he was MP for Varanasi, His Holiness launched one of his books and on another occasion delivered the Lal Bahadur Shastri Memorial Lecture. 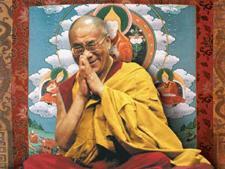 Reciting a quotation from His Holiness, “If you want others to be happy, practice compassion. If you want to be happy, practice compassion,” Shastri concluded that His Holiness is acknowledged across the world as a great spiritual leader. The formal procedures for conferring the graduates’ diplomas were followed, after which they all recited the accompanying pledge in unison. Then, as Director Srivastava announced their names, awardees came up on stage where His Holiness greeted them affectionately and presented each with a medal and certificate. “There you are,” he said, “more evidence that our basic nature is peaceful and compassionate. After all, our lives begin in the care of our mother’s love and affection. “Today, many of the problems we face are of our own making. Why? Because of too much anger and competition, fear and anxiety. This is why we should pay greater heed to the sense of loving kindness that is our basic nature. Instead, problems arise because we accord too much attention to secondary differences between us—nationality, race, colour, faith, whether someone is rich or poor and, in this country, to what caste they belong. This leads to a sense of ‘us’ and ‘them’, which in turn gives rise to division and conflict. Consequently, in our education system we need to promote a sense of the oneness of humanity. “However, modern education, by and large, is oriented towards material goals. And we tend to seek sensory experience, pursuing short-lived external pleasures, rather than engaging with our main mind or mental consciousness. The ancient Indian traditions had a fuller knowledge of the workings of the mind, including an understanding of the emotions and how to manage them. From this emerged the practice of ahimsa motivated by karuna—non-violence and compassion. “The practices for cultivating a calmly abiding mind and insight—shamatha and vipashyana—gave rise to the notions of self and selflessness. The Buddha did not deny that there is a self, but explained that it exists only as a designation on the basis of the body and mind. There is nothing else separate from this. “These days quantum physicists assert that nothing exists objectively. They stress the crucial role of the observer. But when we want to know more about the observer, they have no answers. “The ancient Indian traditions outlined the existence of positive and destructive emotions, pointing out that it is the destructive emotions that are the real trouble-makers. Since they arise in relation to our own minds, dealing with them is our own responsibility. Praying to God or the Buddha to intervene will have no effect. This is why I suggest that, just as we maintain physical hygiene for reasons of health, we also need to cultivate a kind of emotional hygiene. His Holiness explained that there was a time when scientists only talked about how the brain functioned. Now more of them recognise the role of the mind, that the mind can be trained and that when the mind is trained it affects neuroplasticity, observable changes in the brain. “That’s what I want to share with you,” His Holiness concluded.